Yesterday I started my first sourdough loaf. I usually prefer a no-knead approach, but decided to knead this mostly whole wheat dough with my stand mixer. It was kneaded for 12 minutes at 4 in a Delonghi/Kenwood. At the end, there were great gluten strands, and the dough was at about body temperature - 98F or so. Did I ruin my dough letting it get this warm? I immediately stuck it in the fridge - where it didn't seem to rise much if any - overnight. After 2 hours on the counter it still hadn't warmed up, so I don't know if it will rise now. Have I screwed up? For some reason I was thinking the dough shouldn't get over a good yeast dissolving temperature. Now I've looked back on this forum and see references to a target dough temperature in the 70's. I'm guessing that higher temps aren't good for the dough itself. If I did manage to kill the yeast, I've thought about trying to salvage the bread this way. - Mix new starter and water in bowl of stand mixer. - Blend in existing dough. - Blend in more flour and salt to restore flour/water percentages. -----------Edited to Add - After rereading the description of overkneaded dough in Laurel's book, I think that's what I have. I suspect this dough won't have the greatest flavor even if I do get it to rise, so I'm going to bake it as is. It actually looks pretty good! Woohoo! Thanks Mini. About how much time should I have given it before placing in the fridge? Or I guess I should say, what should the dough look like? Since I was worried I may have a bad flavor, I decided not to mix in any more. (Better one not-so-good loaf than two.) It's just out of the oven. To my surprise, it actually looks pretty good. 8-) Since it's after 1:00 AM here, I guess this is one loaf I'll actually let sit for several hours before I cut into it. I've read about others having dough warm enough to work with only an hour out of refrigeration. I think mine took more like four hours. Glad to hear it, now off to bed! KipperCat, about the overkneading...I also have a Kenwood Chef and going by the length of time and the speed you used I think you really did overdo it a bit. Today I made a sourdough in the mixer (just like you - I usually use the no knead method but today I wanted to try using the mixer...) so in order for the dough not to get too hot I started with cold water, and the starter was also in the fridge for a few hours. I mixed on speed # 3 for about 4 min. If I'm kneading a yeast dough that has a much shorter fermentation time then I'll mix for about 8 - 10 min. in order to more fully develop the gluten. Yes, that helps a lot. A lower speed, for 1/3 the time! I realize there's a little bit of leeway, but not that much. I guess I really need to stop back and work on Laurel's Loaf for Learning, and learn about just how the dough should feel at each step. I know it's a different type of loaf than I was making, but I'm sure I can learn a lot that way. I did it a few times several years ago, but didn't have the book then. A good friend had typed out a page or 2 of the instructions, but of course couldn't convey all the info from the several pages in the book. Well, it tasted... sour... and not much else. Well, it tasted... sour... without a lot of the other good flavors that I had hoped for. I still enjoyed it for breakfast, but it's not a loaf I would want to repeat. 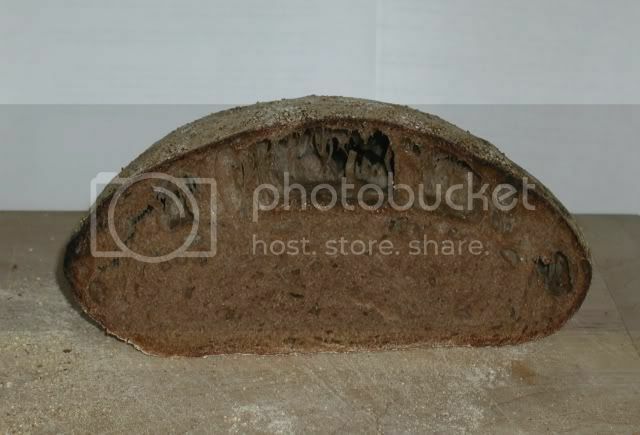 Here are the pics, both the whole loaf which didn't look too bad, and the cut loaf. I thought I got some nice oven spring, as it went in about 3 inches thick, and came out nearly twice as tall. Well, it turns out it was only the crust that rose! I guess all those stalactites in there are gluten strands? I still have no idea if I would have gotten more rise had I left it out longer. First, congratulations on your first sourdough loaf! And I'm sure you will be a much more relaxed with the next loaf. The photos speak a lot, thanks for showing them to us, a good learning opportunity too. Great Bubble, this is one good reason to slash a sourdough loaf before going into the oven, to prevent that, and give the loaf some springing room. The lower 2/3 looks very good. Out of curiosity, a few questions: How long did you let it warm up and rise? Did you reshape or fold the dough after it was warmed up? Also, on what did you bake it, thin or thick pan and where in the oven? Is there rye in the recipe? Hot or cold oven? So you had a jack-in-the-box loaf! Thanks for your kind words. Here’s what I remember about the loaf. Just coming out of the mixer, the dough felt very thick and almost tough. After about 18 hours in the fridge, I left it to warm on the counter for about 4 hours. I think it rose a little. I tipped it out of the bowl, and did a few stretch and folds on the counter. I was going to shape it 20 minutes later, but instead I did another fold and left it to rest. Then I shaped it the way bwraith discussed in his pagnotta blog entry. After letting it sit to seal the seam, I turned it upside down on a towel well-rubbed with flour and corn meal. I then lifted the towel and dough into a colander, where it sat for nearly 3 hours, and rose a little bit - though still not to the top of the colander, let alone over it. I sprinkled the dough liberally with cornmeal, then placed a cookie sheet on top and flipped it over. It transferred very easily to the baking stone. The sort of ruffled edges you see on the loaf are from the folds of the cloth in the colander. The pizza stone and oven were preheated to 500F, and I sat a small saucepan with boiling water on the oven floor after loading the dough. Reading over this, I wonder if there would have been enough time even if the dough had warmed up in an hour as I hoped. My starter was mostly whole wheat with some whole rye and some AP. All the added flour was whole wheat. These are the approximate amounts, so the dough was about a 91% hydration. By the way, it tasted quite good tonight with honey peanut butter. We often snack on peanut butter, the honeyed variety was purchased by mistake, but just the thing for this bread. You might consider calculating the friction factor of your mixer when making this type of dough for more consistent results at an optimum final dough temp. There is an easy method for determining water temp mentioned in the SFBI Artisan I thread. Hope this helps. biscuitman - first I want to thank you for your detailed post and apologize for not responding sooner. At first I wanted time to re-read and think about it. Then every time I logged on to the forum, things got crazy at my house. Regarding the books, I’ve looked at Rinehart’s briefly before, but not Jeffrey Hamelman’s. After a quick look on Amazon, I’m requesting it on ILL from the library. (My book budget is nonexistent right now!) I think it will answer some questions I’ve had. I hadn’t thought to do a windowpane test for a high hydration dough. This one was 91%. I’ll definitely try one next time. Thanks for your comments on slashing. I don’t know why I didn’t do any here. I guess I forgot because the NYT/Jim Lahey no knead breads don’t need any, and that’s what I usually bake. I decided not to take your last piece of advice – that of making small adjustments each time, though I certainly see the sense in it! 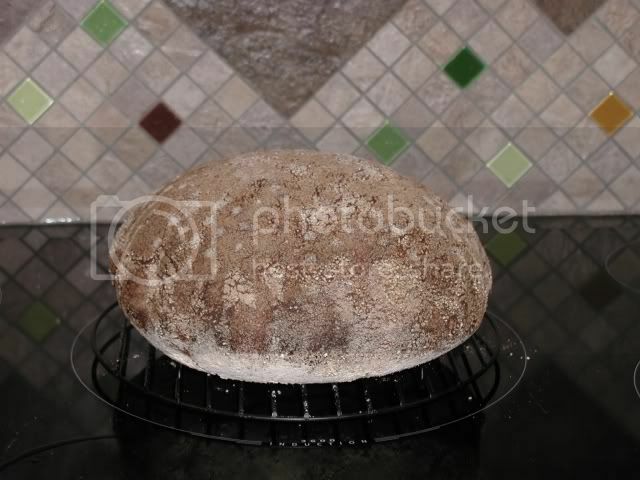 One of my baking goals is to develop a sourdough 100% whole wheat sandwich loaf that is soft enough for my husband to like – a combination of the Mrs. Baird’s 100% whole wheat that we buy and something with more flavor. So I decided to switch to a sandwich loaf. It’s rising on the counter right now, and I’ll post pics in my blog tomorrow. Welcome to The Fresh Loaf, Biscuitman. I’ve enjoyed reading your first post – and learned some things as well. As you can tell, I’m still a novice at bread, and most of what I’ve learned has been here at The Fresh Loaf. There are lots of nice folks here, and I hope you enjoy the site as much as I have.